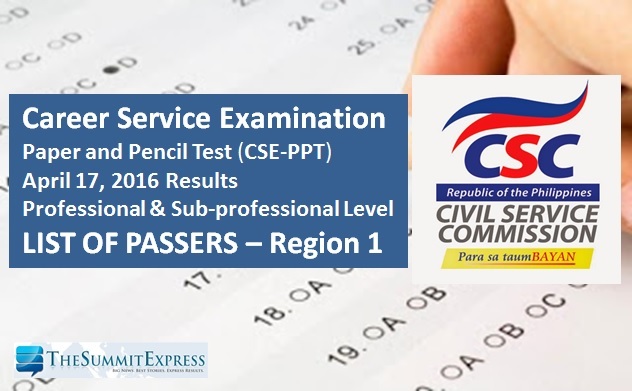 Those awaiting results for April 2016 Civil Service Exam - Paper and Pencil Test (CSE-PPT) known as the career service exam can find here the complete list of passers as the Civil Service Commission(CSC) officially released results for Region 1 on Thursday, May 26, 2016. Check out on this page the list of passers for professional and sub-professional level. CSC said that a total of 1,054 examinees in Region 1 (Ilocos Region) passed the professional level exam while 293 hurdled the sub-professional level examinations. Here's the full list of successful examinees for Region 1 (Ilocos Norte, Ilocos Sur, La Union, Pangasinan) civil service exam (CSE-PPT) professional level and sub-professional level. 514 01 109741 GUZMAN, SHERWIN DC.